Time's up for Dezeen Watch Store, which is to close for business with a huge final sale. The closure will allow Dezeen Limited founders Marcus Fairs and Rupinder Bhogal to focus on their core digital publishing business, which is enjoying a period of unprecedented growth. Starting today, customers will get a final chance to shop at the store and pick up a design classic at a discounted price. Launched in 2009, Dezeen Watch Store was the first-ever online store for design-led watches. Building on the success of Dezeen, the world's most popular design magazine, it helped create a new market for affordable, stylish timepieces and played a key role in the launch of many new boutique watch brands. The past eight years have seen an explosion of new watch brands, as entrepreneurial designers started companies to produce their own products, rather than designing for others. A combination of crowd-funding platforms such as Kickstarter, low-cost manufacturing – particularly in China – and digital media lowered the barriers to entry. Previously customers looking for a stylish watch had to choose between the expensive, luxury end of the market and the affordable end, which was dominated by Swatch. Now suddenly they had a wide range of choices in between these two extremes. Dezeen Watch Store played a key role in this movement. It helped introduce watches to a new generation of younger customers who had grown up with smartphones and therefore previously saw no need to wear the time on their wrist. But designer watches soon came to be regarded as personal style statements rather than practical objects, with the time-telling function becoming relatively unimportant. This in turn freed up designers to experiment with new forms. Dezeen's curated selection of mostly clean, minimal watches became highly influential and helped trigger a proliferation of brands. Pioneering marques including Uniform Wares in London and Void in Hong Kong, both of whom sold through Dezeen Watch Store from the outset, were soon followed by many other startups. In 2014 we helped Eone launch The Bradley, the first-ever tactile watch for the visually impaired, which has gone on to be a bestseller. We also worked closely with Instrmnt, the Glasgow-based company that quickly became our most popular brand after it launched in 2014. Dezeen Watch Store's cheeky "Buy a normal watch" promotion poked fun at the Apple Watch. Dezeen Watch Store became an instant success, with architects, designers and style leaders around the world proudly wearing watches bought from the store. Famous customers included actor Robert Downey Jr, who bought a wide selection at our first-ever pop-up store, and fashion designer Rossita Missoni, who still wears the timepiece she bought for her late husband. Our pop-up shops became a major draw at design festivals around the world and our innovative marketing campaigns, including the cheeky "Buy a normal watch" promotion that poked fun at the Apple Watch, drew attention to the store. In 2015, Fairs was included in watch magazine WatchPro's Hot 100 list of the most influential people in the watch industry. The magazine praised Dezeen's "marriage of unfettered creativity and rigid business discipline". However the sub-luxury watch market has become crowded, shoppers are increasingly price sensitive and the smarter watch brands now sell directly to their customers, rather than relying on retailers such as Dezeen Watch Store. The depreciation of the pound following last summer's Brexit vote has also affected margins, since most of our stock is purchased from overseas countries. Fairs said: "We are immensely proud of what we achieved with Dezeen Watch Store and we'd like to thank all our suppliers, customers and everyone who's worked with us over the past eight years." "We'd particularly like to thank our staff for their hard work and wish them well in future." 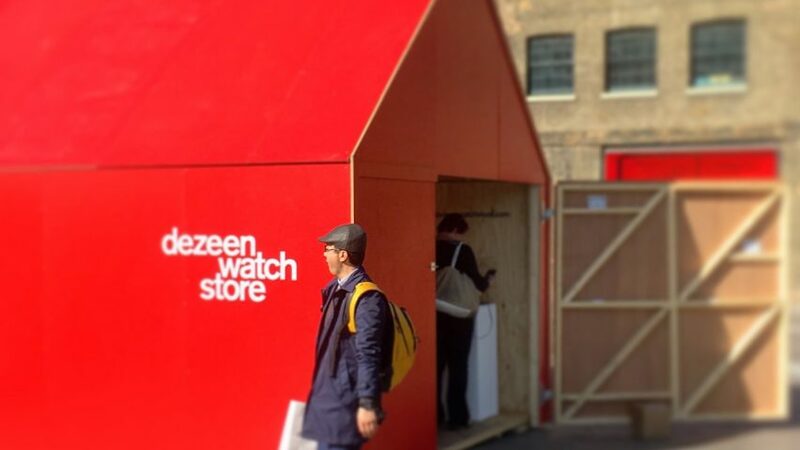 Dezeen Watch Store is operated by Dezeen Stores Limited, a limited company registered in the UK. It will cease trading in July this year and become dormant. The company's directors are Marcus Fairs, Rupinder Bhogal and Nigel Palmer. The business remains solvent and all liabilities will be met as the company is wound up in an orderly manner. Its sister company Dezeen Limited is unaffected by the closure. Any product purchased in the sale will still be subject to a full manufacturer's warranty and Dezeen Watch Store's returns policy. For more details, see Dezeen Watch Store's FAQs page. The full story of why Dezeen opened a watch store is told in this 2014 interview with Fairs.